The recipe below, which requires no shrimp paste, is a Burmese-Chinese version of laap, the herby Thai minced meat dish. 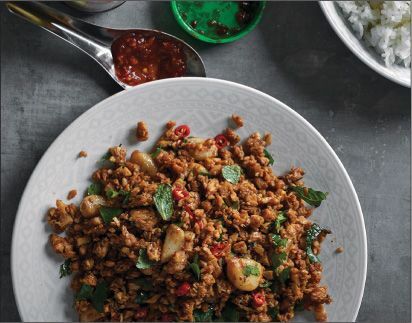 The minced chicken is stirfried with ground cumin and mustard seeds, ginger, garlic cloves, and a spoonful of sambal oelek—a blend of red chilies, brown sugar, and salt that can be found near the Sriracha in many Asian markets. You can turn this into a vegetarian dish by replacing the chicken with tofu—diced, then drained on paper towels and stir-fried. The fried garlic cloves add extra texture. To mince the chicken, place thighs smooth side up on a cutting board. With knife blade parallel to cutting board, slice each thigh in half width-wise, opening it up into two thin pieces. Cut chicken against the grain into thin strips, then chop strips finely until evenly minced. In a skillet, toast cumin and mustard seeds until they pop, no more than 30 seconds. Transfer to a mortar with a pestle, and pound into a coarse powder. In a small bowl, blend sambal oelek, soy sauce, fish sauce, and sugar. In a large skillet, heat oil over medium heat. Tilt pan so oil pools to one side, then add garlic cloves. Fry until light golden and soft, about 1 minute. Remove garlic cloves and reserve, leaving the oil. Heat skillet over high heat. When oil is hot (not smoking), add minced garlic and ginger. Stir-fry for a few seconds and add the chicken, spreading it out evenly with a wooden spoon. After a minute, give pan a stir so chicken doesn’t stick together. Repeat this step until chicken is light brown in places and pale in others, about 3 minutes.